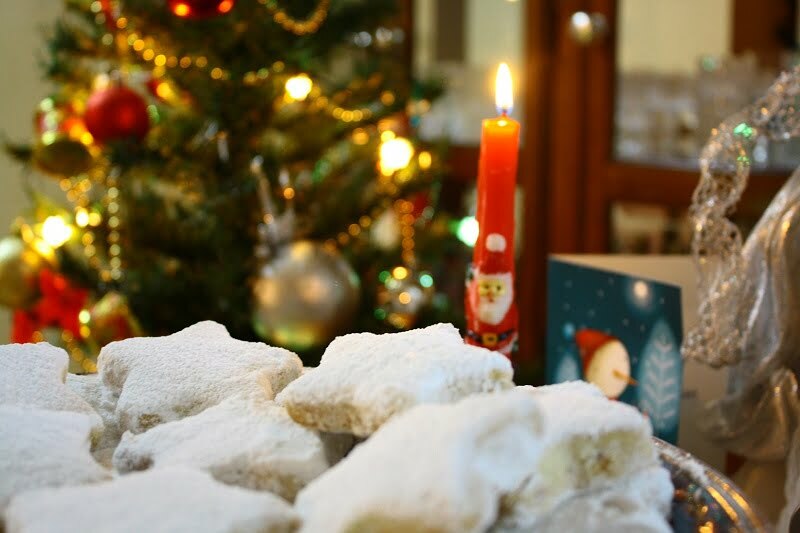 Kourabiedes are Greek cookies, similar to shortbread cookies, coated with icing sugar. Their main ingredients are butter, icing sugar and flour. They are usually flavoured with vanilla or masticha (mastic resin) and a well known brand of Greek brandy is also added. Instead of brandy, twists to the traditional recipes call for rum, ouzo or other alcoholic beverages. In Cyprus, the cookie is wet with rose water and then coated with icing sugar. There are many recipes for kourabiedes as each family adds something different to make them. A very significant factor to have tasty kourabiedes lies mainly on the quality of butter used. Ewe’s milk butter or a mixture of ewe’s and goat milk butter is used but if you can’t find any, you can substitute it with regular butter. Although they will still be delicious, the taste will not be the same. In Cyprus, we used to make them with spry shortening but this is not available in Greece. I’ve also made them with buffalo milk butter and they tasted amazing. The word Kourabies (plural kourabiedes) originates from Qurabiya in Azerbaijani, Qurabiyə,in Arabic, Kurabiye, in Turkish and of course you will find this “cookie” under a similar name in many other countries as well. The word literally means Kuru = dry, biye = biscuit. However, the word biscuit was given around the Middle Ages, etymologically deriving from the Latin bis-cuit, which means baked twice. This technique was known in ancient Greece and was called “δί-πυρον” (di-pyron) which means baked twice. This technique was developed by the ancient Greeks mainly to preserve bread for the soldiers and seafarers. In modern Italian, the word for cookies is biscotto (cookies is of Flemish / Dutch origin that passed to the English language). The Latin word bis-cuit, was spread by Venetian merchants to Asia, where it was established as a corruption of the Latin word to biya / biye, which they connected with their own Qura / Kuru (which means dry) and gave a new compound word mixing Latin with oriental to form the word Qurabiya / Kurabiye. This word was later borrowed and it thus returned to the West. The Hellenized word “kourabiedes” was formed in the sense of dry biscuit, which was mixed with almonds and coated with icing sugar. Almonds were used because of their abundance in Greece and Cyprus but depending on the regions where there is abundance of walnuts, they are used instead of almonds. The production of pistachios in Greece started in the early nineteenth century and now this is also used. When these cookies became a Christmas treat, they were given a crescent shape and a whole clove was inserted on the top to represent the gift of spices that the Three Wise Men brought to Bethlehem. The sprinkling of icing sugar is probably due to the fact that Christmas is during winter when there is snow but this is only my assumption. Similar cookies I know of, are the Mexican Wedding Cakes, the Spanish Polvorón and the Italian Wedding Cookies. We can shape them by hand by making small round balls around 23 – 25 grams each which can be flattened or give them a crescent shape or even use a cookie cutter. The time of baking will depend on their size and your oven. These aromatic Kourabiedes (Greek Christmas cookies) are flavoured with vanilla and citrus blossom water. Blanche and roast the almonds in a preheated oven to 180o C (350oF), for about 20 minutes. Allow to cool and then coarsely cut them into smaller pieces. Beat the butter with the icing sugar at low speed until incorporated and then beat at high speed for ten minutes until it becomes white and fluffy. Add the brandy, citrus water and vanilla and stir. Bake for about 12 minutes, depending on your oven. (They will be very soft but will firm up when then cool). Using a spray bottle spray them on both sides with citrus blossom water. Turn them upside down on a dry surface and using a sieve, sprinkle some icing sugar. Turn them over again and continue sieving until they are coated. Note: The leftover icing sugar used may be sieved and used again. They yield 65 x 23- 25 grams each. A similar recipe is included in my cookbook “Mint, Cinnamon & Blossom Water, Flavours of Cyprus, Kopiaste! Merry Christmas and Happy New Year to you too, Ivy. Your kourabiedes look very delicious! Merry Christmas and Happy New Year to you, Ivy. Your kourabiedes look very tasty!